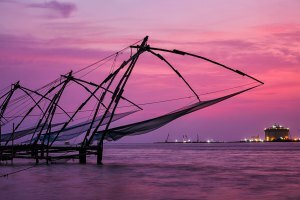 City of Kerala in India, Cochin (or Kochi) is located on the coast of Malabar, and hosts the largest port in the country. It has more than 600,000 inhabitants and is divided into several parts, some of which are on the peninsula, others on the mainland and others on islands, linked by bridges and footbridges. Known for the quality of its spices, Cochin is marked by its history with the West through the old merchant counters, Portuguese and then Dutch, and one finds architectural testimonies like the Jewish quarter and the synagogue, as well as churches, due To a strong presence of the Christian population (20%) compared to the rest of India. You can also visit the palace of Mattancherry with its murals and its particularly remarkable furniture; The synagogue already mentioned, dating from the 16th century and its floor with blue tiles coming from China as well as its chandeliers originating in Europe; The fishing port with the spectacle of its fishermen with square nets and their very ingenious system; The Church of St. Francis, 1503, the oldest in the country; The street of the brocanteurs and its warehouses of spices; The bird sanctuary of Mangalavanam. Do not miss to see a spectacle of Kathakali, a traditional dance and mime theater featuring characters with impressive masks. You reach Cochin by landing on its international airport, but you can also get there by ferry. There are several solutions for getting around town: a good network of buses, taxis, ferries to travel between the islands, rickshaws for small trips. A subway under construction.